Jimenez Lai is the principal of Bureau Spectacular, a Los Angeles-based studio that imagines other worlds and engages with architecture through stories. His first manifesto, Citizens of No Place, was published by Princeton Architectural Press, and he has won various awards, including the Architectural League Prize for Young Architects and Debut Award at the Lisbon Triennale. Lai is participating in the Chicago Architecture Biennial this fall. Neil M. Denari is an architect and author based in Los Angeles, whose office NMDA is dedicated to exploring the worlds of architecture, design, urbanism, and global cultural phenomena. Denari has held visiting professorships at UC Berkeley, Columbia, Princeton, University of Pennsylvania, and the University of Texas at Arlington, and he is a tenured Professor in the Architecture and Urban Design Department at UCLA. Over the summer, Chicago Architecture Biennial team caught up with the architects for a drive around sunny Los Angeles to talk about the city, drawing, and architectural representation. Neil Denari: You’re not a driver yet. Jimenez Lai: I don’t have a car. ND: Are you the new breed? JL: I might be. I mean we did the math and it seems like not driving is more economical than driving. ND: So, were you surprised by the overcast weather when you came to L.A.? What were the mythologies that you came with that either still exist or have been just completely eliminated? JL: I have been out in L.A. several times before moving here and some of the feelings I had before was ‘well here’s an off-the-menu type of city,’ in the sense that you don’t really know what’s going on but there are some great things you could order. You just have to know ahead of time. Architects Jimenez Lai (left) and Neil Denari (right) in conversation. All photos by Jesse Hammer. ND: There’s still politics, and there’s still hierarchy and all of that, but one of the reasons why I’m here and why I stay here is because you can reinvent your position within that field every day, all the time. And it’s interesting you being downtown…. It’s not necessarily the best psychological center.… There is no psychological center of L.A. It’s where you are, and who you’re with. It’s in this car. JL: I think that that’s the kind of composition I’m drawn to — a city like this, where it is everything all over everywhere, with multiple centers of gravity. JL: We’ve never really talked about drawing. Can you talk about that drawing of yours that you auctioned off at UCLA? I tried to purchase but didn’t get it. ND: Well, It’s interesting to think about drawing because I think you really draw and I don’t anymore. I used to, I do some by hand but I’m probably more informed by photography, like Bernd and Hilla Becher, than by architectural modes of representation. So that particular drawing was interesting. I’ve been doing these note book drawings since the late eighties. Those were my musings and they’re hieroglyphic and they’re usually not even connected to a specific project. They’re notes and meditations. I treat them very very carefully so I don’t do any scratchy stuff. Everything is like a very specific drawing. JL: I also struggled with architecture a little bit when I started out because it was not my first choice. My first choice was always cartoons. It was what I wanted to do with my life. ND: I didn’t know that. JL: And, you know, listening to my rational side and influences from my context at the time, I felt like, ‘Let’s look into something useful.’ Eventually it translated into my current practice. So I think that going to the medium of comic book was maybe going to something that felt more natural to me, at the time. It was an easier way for me to speak and I think in doing so I gained a lot of practice. If a comic book page itself is a plan, are there gutters that we walk around? Is that a corridor? Are the frames themselves programmed rooms? Can we even ask questions, then, like the constitution of program in that room? Are we not allowed to eat here at all? What are the rule sets of that room? Jimenez Lai, Citizens of No Place. 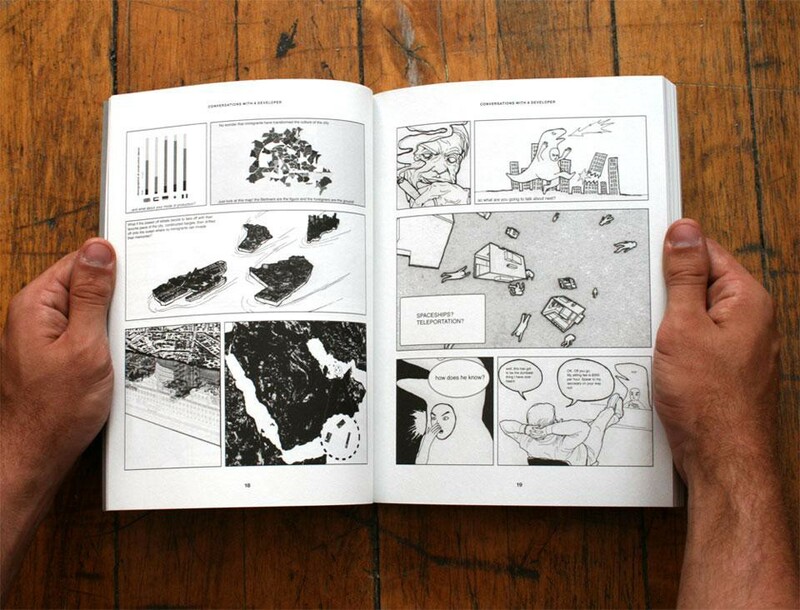 An Architectural Graphic Novel, 2012. Photo by Jimenez Lai. ND: If I think of some of your drawings where the page is like a poché and then you’re going to put an episode in, and then a wormhole to get to the next episode, that’s super literary, you know very Lewis Carroll, Thomas Pynchon…some weaving of a story and the ellipses between things. That’s an interesting way of thinking about L.A. because L.A., while it doesn’t have walls, it also has limits that make location and episodes happen. This is especially true when you get in your car and drive around and the idea of being able to make a project as field as opposed to a build up of spaces and cores and events that do or don’t run in a linear fashion or make sense or cohere. BUREAU SPECTACULAR, led by Jimenez Lai, imagines other worlds and engages with architecture through stories. Bureau Spectacular’s installation White Elephant is in the collection of the Museum of Modern Art, New York. The studio designed the Taiwan Pavilion at the Venice Architecture Biennale in 2014. NEIL DENARI is an architect and author based in Los Angeles. He started his practice in New York in the 1980s, exploring the technical and formal impact of technology on architecture. His office NMDA is dedicated to exploring the worlds of architecture, design, urbanism, and global cultural phenomena. In 2011, Denari received the Los Angeles AIA Gold Medal. He is professor in the department of Architecture and Urban Design at UCLA. This is an excerpt of a longer conversation, condensed and edited for clarity by Consortia. 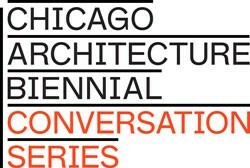 The full text of this conversation and many others will be featured in The State of the Art of Architecture, the catalogue of the inaugural Chicago Architecture Biennial. The book will be published by Lars Müller Publishers in November 2015. For more information, visit http://chicagoarchitecturebiennial.org/exhibition/publications.